One of the world’s leading theoretical physicists and science communicators, Stephen Hawking inspired millions to mull grand questions about the cosmos and our place in it. But he was apparently pleased to be included in others’ make-believe universes, too. A.W. Peet, a professor of physics at the University of Toronto, attended a 1993 conference on the quantum aspects of black holes with Hawking that just so happened to coincide with the airing of his TV cameo on Star Trek: The Next Generation. Hawking, who died Wednesday at age 76, appeared in a holographic scene aboard the USS Enterprise. “After the day’s activities, we all crowded around the screen and watched this episode of Star Trek together,” recalls Peet, who was a graduate student at the time. “It featured Stephen playing poker with Isaac Newton, Einstein and Data, I think. The anecdote captures much of what made Hawking such a unique figure – both in the realm of science and popular culture. On the one hand, he was a brilliant mind whose work on black holes was hailed as groundbreaking. But he was also a great scientific communicator who authored several books and made more than a dozen TV appearances. Hawking’s star first began to rise in the early 1970s when he made a startling discovery: Black holes are not really black. Instead, he found they leak energy and particles, and eventually explode – a phenomenon that became known as Hawking radiation. But Hawking was far from a one-hit wonder. He continued to publish regularly in the decades that followed, with his two most recent papers coming last year. “His discoveries laid the foundations for a lot of really fascinating research areas that are currently being developed,” Peet says. Unusual among physicists, Hawking also managed to convey his complex ideas to the wider public. He wrote the 1988 book A Brief History of Time: From the Big Bang to Black Holes hoping it would help him pay for his children’s education and his own home care. It ended up selling 10 million copies. Equally impressive, Hawking managed to accomplish almost all of what he did while battling Lou Gehrig’s disease. First diagnosed at the age of 21, the degenerative nerve illness gradually left him paralyzed over decades. He spent much of his life confined to a wheelchair and spoke via a voice system he initially controlled with his hand and, later on, a muscle in his cheek. 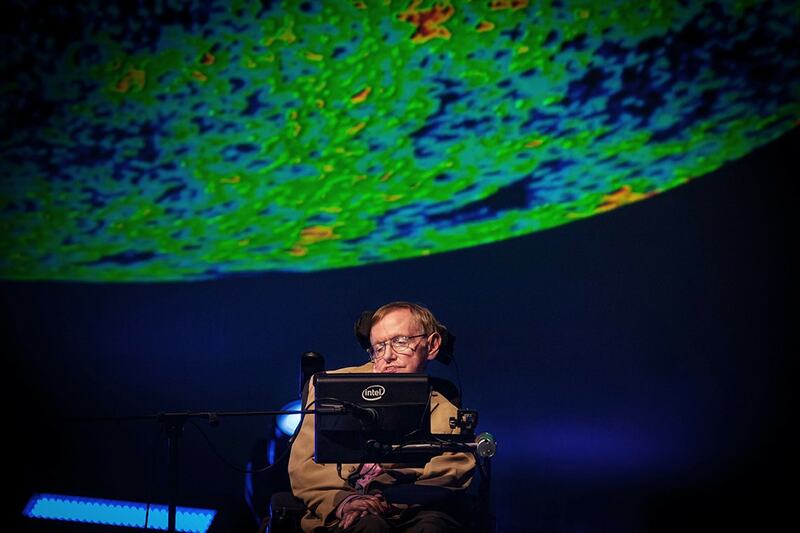 Hawking’s now iconic digitized voice delivered presentations and lectures around the world. That included a sold-out 1998 appearance at U of T that was organized by a group of students – apparently after a discussion at a local bar. “Convocation Hall was packed and there was suitable drama,” recalls John Polanyi, a Nobel Prize-winning chemist and U of T University Professor who introduced Hawking at the event. Polanyi, for one, says he’s amazed at the sheer number of events Hawking participated in over the years, from academic conferences to public appearances. Peet, too, cites Hawking as a major career influence – both because of his intellectual prowess and his sheer determination to overcome incredible obstacles in the name of science. They first met at a Stanford University professor’s house in 1992 during a small dinner gathering associated with yet another conference. “It was hugely influential,” Peet says of that brief, but fateful one-on-one conversation.